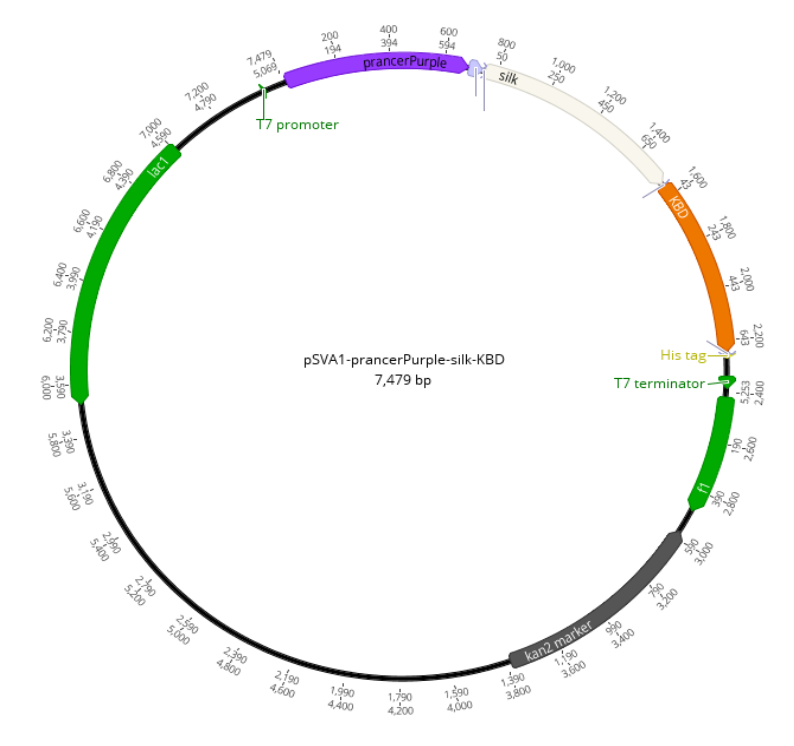 We assembled our constructs and cloned them into pSVA1 plasmid using Golden Gate assembly. 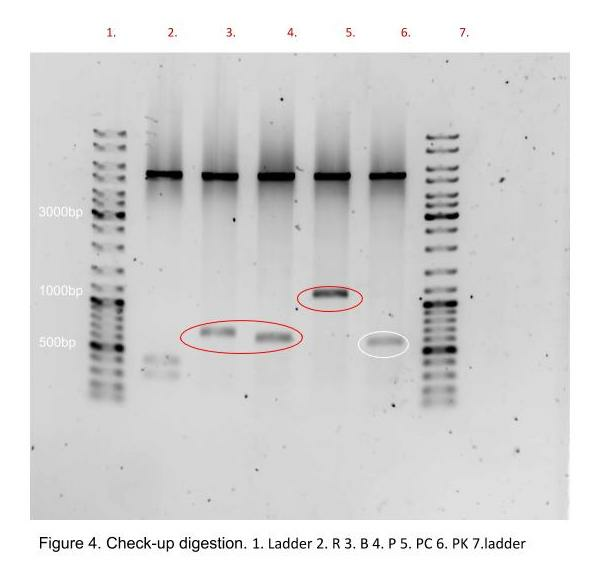 After transforming plasmids to E. coli DH10B and plasmid isolation we performed a check-up digestion with restriction enzymes NcoI and XhoI which cut the plasmid backbone close to BsaI insert site. Sizes of our inserts can be seen from table 1. Assembly and cloning were first done to non-silk constructs RK, RC, BK, BC, PC, and PK. 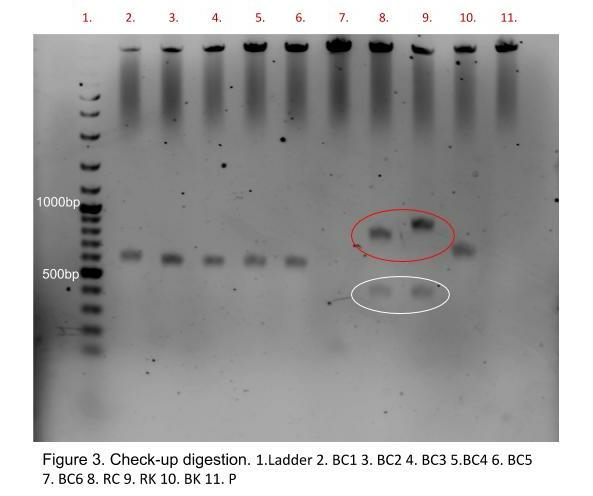 As we mentioned before and as can be seen from figure 3, assembly of Blue chromoprotein sgBP containing constructs did not succeed as the samples did not contain correct insert (samples 2-7) and we did not perform any further tests for BK and BC. Also RC and RK, samples 8 and 9 respectively, did not seem to contain correct inserts but after further inspection, we noticed that NcoI cuts mRFP inside its sequence leaving us with a smaller piece (white circle) and the rest of the mRFP and binding domain (red circle). Summing the sizes pieces, we identify both RC and RK to have correct insert sizes. As controls we tested the chromoproteins without any binding domains. 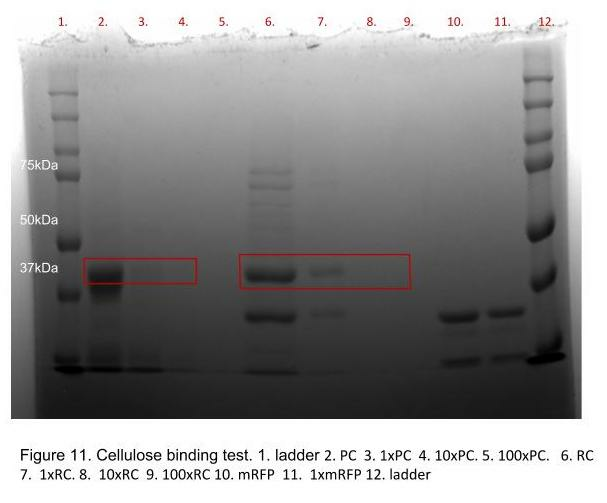 From figure 4 we confirmed that chromoprotein mRFP really was cut with NcoI at approximately middle of the sequence (sample 2). All singular chromoproteins (samples 2-4) contained correct inserts as did PC (red circle). We had some problems assembling PK (white circle) which did not seem have a correct insert and had to be redone. We redid the PK while assembling our silk containing constructs and finally managed to get correct inserts (figure 5, sample 4, red circle). As can be seen from the figure, our digestion of constructs containing only chromoprotein and silk repeats did not succeed. Enzymes seemed to cut only from one position leaving us only plasmid and linearised plasmid+insert on the samples 2 and 3. We did not proceed to test these constructs any further. We also performed colony PCRs to our BioBricks because we had some problems obtaining the correct inserts. 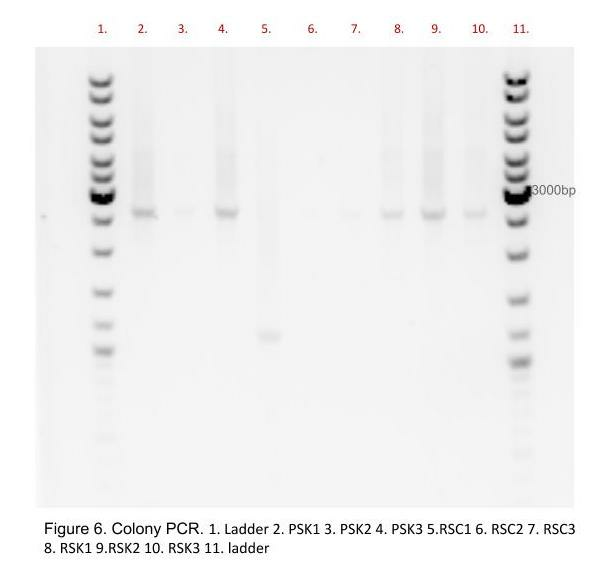 Our first colony PCR (figure 6) but it suggested that PSK and RSK might have the right inserts. 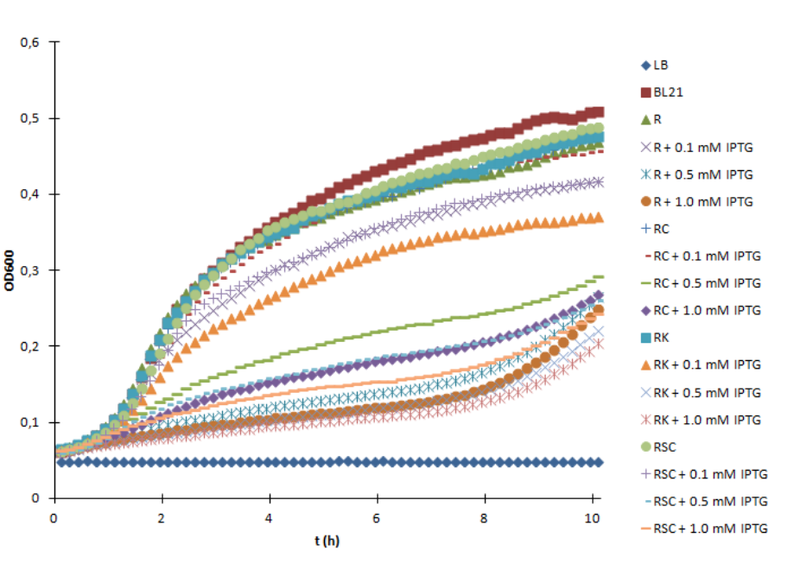 We did not submit a BioBrick of RSC because of the nonexistent results (samples 5-7). 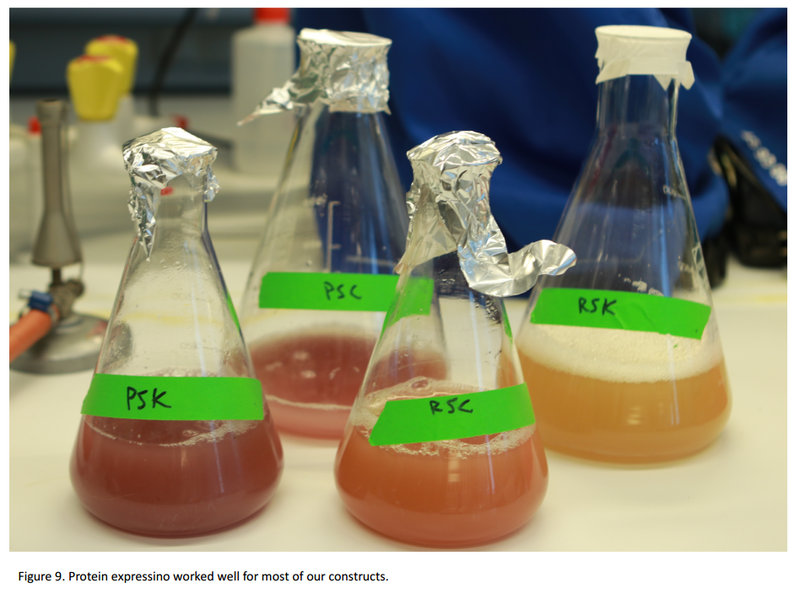 Additional screening for PSK and RSK produced better results and we identified that samples 9 and 10 (figure 7) and samples 2-4 (figure 8) have correct samples for PSK and RSK respectively. 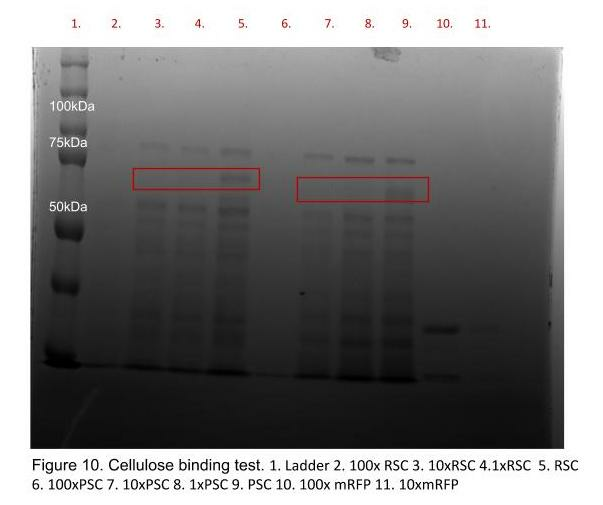 We were also able to obtain correct inserts for PSC (samples 4-6, figure 7) and for ADF3 silk repeats (samples 7 and 8, figure 7). 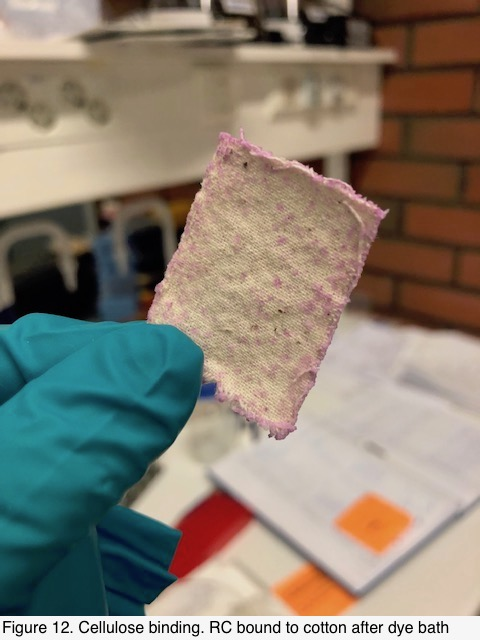 We were able to successfully express and purify our silk containing proteins with the heat protocol and the ones not containing silk with ÄKTA. We performed a growth test using a 96-well plate and a plate reader to see how the production of some of our proteins affects the growth of the bacteria. 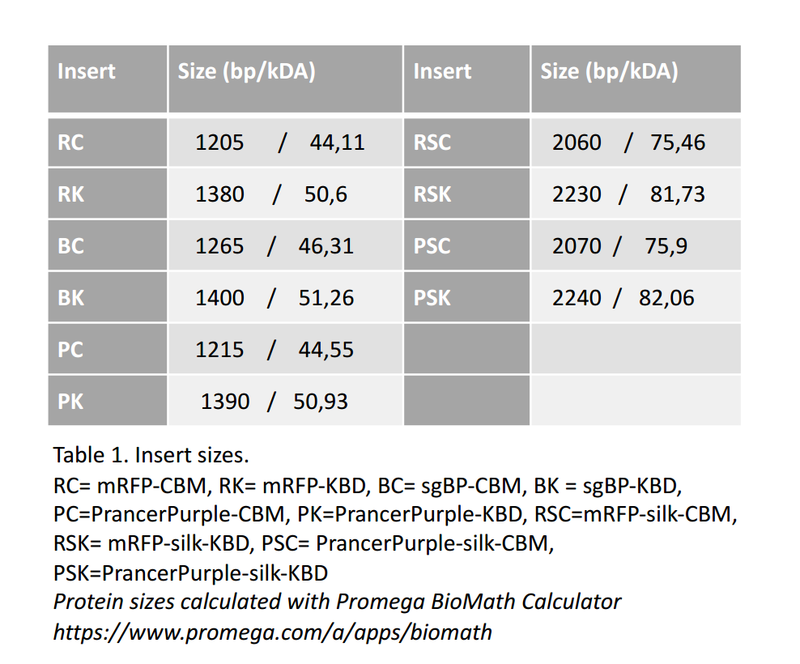 The strains containing the constructs mRFP, RC, RK, and RSC were tested at varying concentrations of IPTG (0 mM, 0.1 mM, 0.5 mM, 1.0 mM) to induce protein production. We also included control samples containing either E. coli BL21 (DE3) without any plasmids or only LB without any inoculum. The plate reader was used to measure both OD600 and the fluorescence of mRFP over approximately 10 hours. For the fluorescence measurements, the excitation and emission wavelengths were 584 nm and 607 nm, respectively. The OD600 measurement data can be seen in Figure OD and the fluorescence data is shown in Figure Fluorescence. A general trend in the OD600 measurements is that increased concentrations of IPTG lead to less growth. In the samples with 0.5 mM or 1.0 mM of IPTG it seems like the bacteria stayed in the lag phase for most of the experiment. Slowed growth due to the induction of protein production can be expected since this uses energy that the bacteria could have used for multiplying. The control samples worked as expected, i.e. the OD600 of the LB control did not increase and the fastest growing strain was the one that didn’t contain plasmids. As expected, the samples without any added IPTG all have approximately the same base level of fluorescence. They also have the lowest fluorescence of the samples, which can be explained by them not producing the fluorescent proteins without induction. Generally, 0.1 mM of IPTG caused the highest fluorescence readings, whereas 1.0 mM of IPTG resulted in the lowest values. However, the differences between the different concentrations are relatively small, with the notable exception of the mRFP construct in 0.1 mM IPTG. This sample has a much higher amount of fluorescence than any of the other samples. It should be noted that the measured fluorescences only increase a little during the experiment for most of the samples. Visual inspection after the experiment also revealed that there was not a lot of red color visible in the wells of the plate. It is, therefore, possible that a higher starting OD600 could have been beneficial to produce more protein. We tested the binding ability of our constructs that contained CBM. Samples were desalted prior to the binding assay using Econopac columns. Varying concentrations of samples containing the CBM were mixed with cellulose nanofibrils (CNF) so that in the mixtures the protein to CNF ratio was 1:1, 1:10 or 1:100 (weight:weight). Also, control samples without the addition of CNF and mRFP as an additional control were prepared. The samples were incubated for one hour before centrifuging and preparing SDS-PAGE samples from the supernatant. SDS-PAGE was run in 7.5% acrylamide gel. For both RSC and PSC (figure 10) bands at 75kDA and for PC and RC (figure 11) bands at 44kDA were expected. RSC and PSC on figure 8 seem to have bands a bit lower than 75kDa which might be due to uneven gel electrophoresis as the lanes are tilted so the ladder does not point to exactly right places. 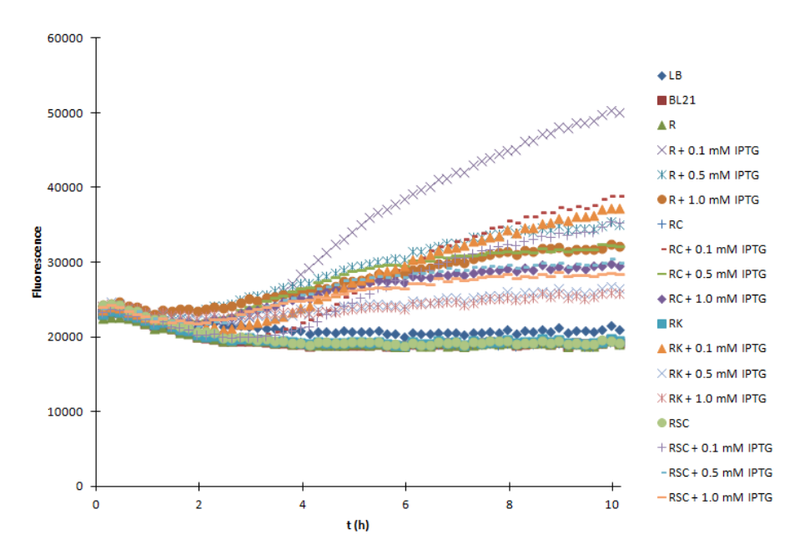 There is a lack of bands at ~75kDA on samples 3,4,7 and 8 (figure 10) which implies that both RSC and PSC at concentrations 1:10 and 1:1 have successfully bound to the CNF. We assume this is because samples were taken from the supernatant and it comprised only of proteins that did not bind to CNF and thus were not pelleted to the bottom while centrifuged. Similar lack of bands can also be seen in figure 11 on lanes 3 and 7. Bands on lanes 2 and 6 are very faint which may be due to a too low concentration of our protein in the sample. 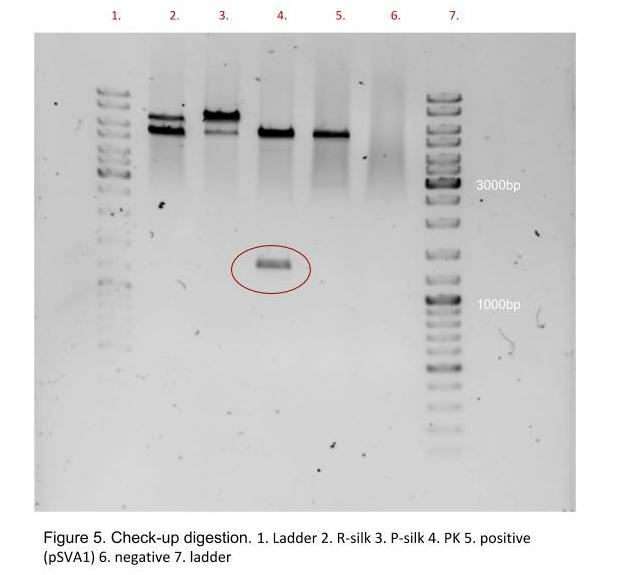 The lack of bands on both samples 2 and 6 (figure 10) and 4,5,8 and 9 (figure 11) is most likely due to the low concentration of samples which is below the detection limit of Coomassie Blue staining. 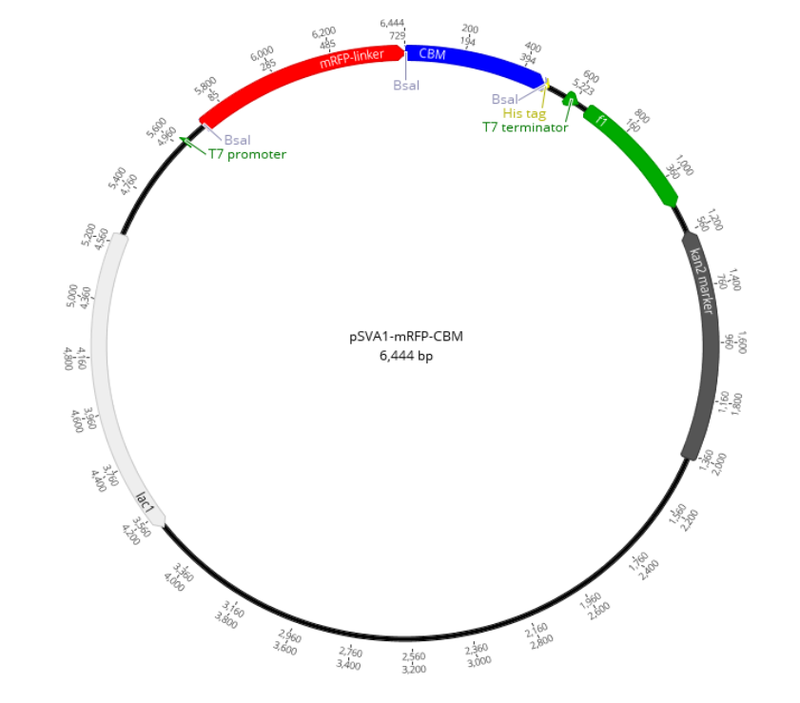 There are a lot of other proteins other than RSC and PSC as can be seen from figure 8. So even though purifying the constructs using our heat protocol was more inexpensive and faster it did not produce very pure samples. Even with higher heat there still seems to be unidentified proteins that do not denature. 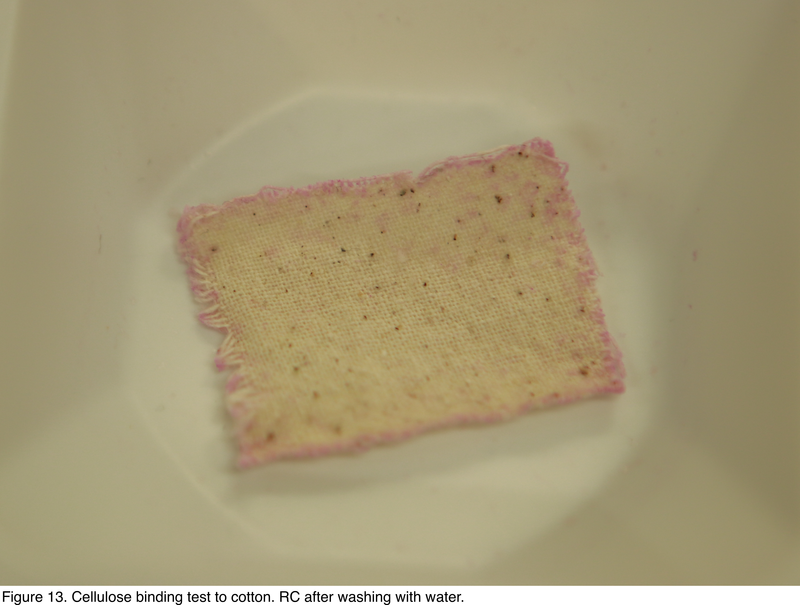 To test how our proteins would work in the textile dye application we tested binding of one of our samples to a cotton textile provided us by Purewaste. 3ml of RC was applied to 2x3cm piece of untreated cotton and was left shaking overnight at room temperature. On the next day, there seemed to be some color stains on fabric but they were quite faint (figure 12). The cotton sample was washed by applying 5ml of water on it and left shaking for one hour. Most of the color on top of the fabric washed off but some of it stayed in the corners, bound to individual fibers (figure 13). We identify that RC was still successfully able to bind to cotton even though the result was not an intense color. It might be that the cotton we used was woven too dense and because it was made of recycled materials it might not have worked the same way as pure cotton. Due to lack of time to produce enough protein we were not able to do proper color scale test with CIELAB, test other proteins or the color fastness with UV light.  This leaves possibilities to further test and develop this product in the future. 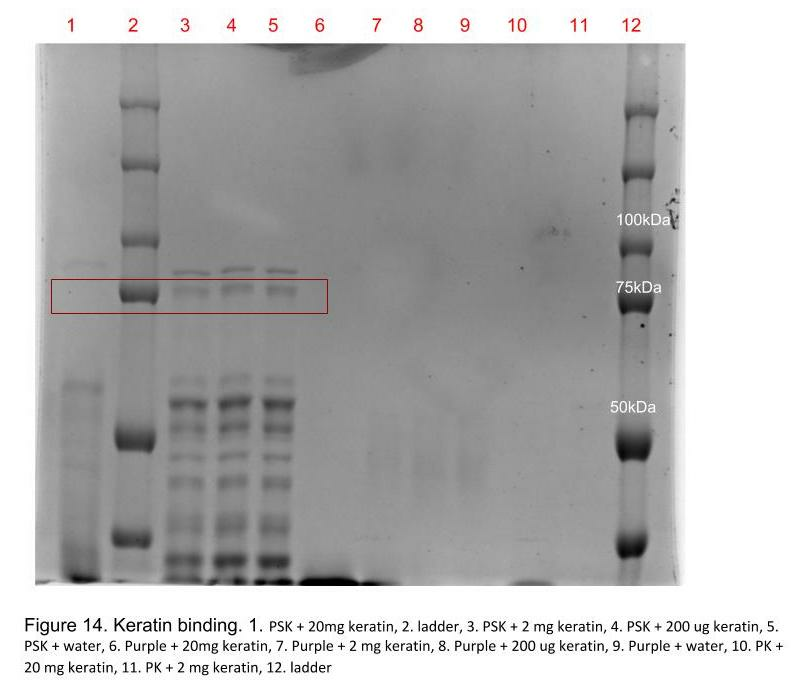 The KBD we are using is still fairly little tested on keratins other than cytokeratin and thus we conducted some tests to analyze its binding ability. We performed a similar binding assay to KBD as we did to CBM. Samples were desalted using Econo-pac columns and varying concentrations of KBD containing protein and keratin were mixed: 1:1, 1:10, 1:100. In figure 14 we identified the band on sample 5 at ~80kDa to be PSK. We also tested PK and RK but the results suggest that the concentrations of those two were too low because the bands are faint or nonexistent. We suspect this because of the samples PSK was concentrated the most and it produced visible results. We analyzed that PSK might have bound to keratin in higher keratin concentration (20mg) which can be seen as a lack of band at ~80kDa on sample 1 (figure 14). In lower concentration, there did not seem to be any binding which can be seen as bands on the lanes 3 and 4. However, this might be a result of there being too much protein compared to keratin making the keratin saturated and there are non-bound PSK left in the solution. As results from this test were not very clear it might be that the keratin concentration we used was not high enough for this test for PK and RK. It is also unsure whether the keratin contained salt which could also affect the test. To further characterize KBD there definitely needs to be more binding tests like this to be done but with a different kind of keratin and with different concentrations. This test did not seem to show any remarkable results. It might be due to a low concentration of the protein which is why there was not any color change to be seen. Keratin in hair might also be too difficult to access and would have needed to be treated for example with urea which is not suitable to be used in hair dye application. Due to lack of time and because the urea treatment would not have been suitable for our purposes we did not continue this test any further.